So the other day I had to cancel a party. The real reason had little to do with me, but I took the opportunity to do some constructive conjecturing. For instance, nobody would have come to my party anyway. Because I have no friends. And also people don't like me. Noah and I recently began clearing the underbrush from the Poo Woods to transform the area into Fort Etheridge. As it turns out, we have several hundred square feet back there, which is utterly perfect for all manner of fort building. While I envision a little stone pathway leading up the hill to the front entrance, Noah has images of gangways and crow's nests dancing in his head. Whatever. As long as I have a place to plant the hostas (because a fort isn't always under siege, so you might as well have something nice to look at). Ethan asked me to play "beeseball" with him today during his allotted and forsook naptime. I'm still amazed by the weather: 60s–70s, blustery, crunch leaves flying by on the wind, after a summer of record-breaking 90+ degree heat. Anyway, I tossed him a softball while he held his Little Tykes t-ball bat in a remarkably close-to-correct batting stance (lefty, by the way), and he hit the ball! Three times! Sure I shouted "hit it!" every time I tossed the ball; but the only difference between me and a major league coach is the hand signals. I think it's because I planted mums around my fort. 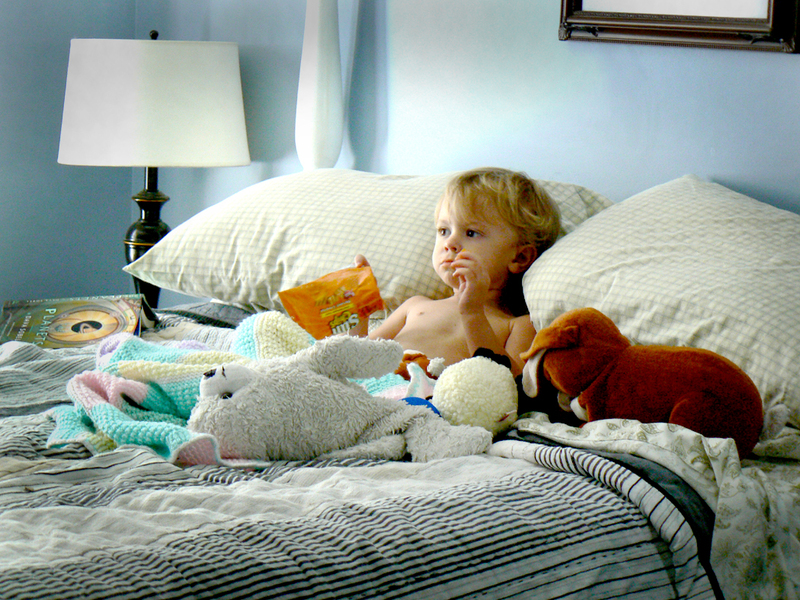 Does Ethan have a little bell to ring when he wants more snacks or a juice box?! That is the cutest picture! HAVE PARTY!!! I WOULD BE THERE. Well, if I didn't live over here, that is. Also, my dad built me a fort and I think the gratitude and awe I felt from this not-so-simple act carried us through the Sullen High School Years. Continue to teach the left-handed thing. Lefties can pitch professionally these days until like 70 years old, right? Greatest photo ever, and what they all said -- lefty is good, forts are good, and it's not you (speaking for myself) it's the pampered chef thing. If it makes you feel any better, my husband wants to have a birthday party for me and I told him no because a) there is nothing awesome about 27 and b) would if nobody comes?? Lish—A girl's gotta do what a girl's gotta do, etc. Lisa—I wish he had a bell. At the moment he just yells. L&WH—I knew I could count on you! Lisa—I'm planning a late-October marshmallow roast. KL—I think the only person who never has to worry about a lack of RSVPs is Oprah. Who needs parties when you have the next Babe Ruth to train? okay now i want to know why the party was cancelled.